When focusing on design, bathrooms are often overlooked and neglected. Reclaiming your lavatory as a stylish space which fits well with the rest of the house not only increases the value of your home, it can also turn a functional room into a personal sanctuary. Read on to learn what to expect from bathroom design in the upcoming year! Asian designs are minimalistic and serene. Its open, flowing design incorporates natural elements with indoor décor. Walls become curved, showers transform into waterfalls and stone motifs make you feel as if you’re in a garden. Spa-inspired bathrooms bring the feel of being on vacation to your home. The design is modern, yet tranquil and luxurious. It turns the bathroom into a place of escape and rejuvenation. French designs are luxurious with modern elements. It incorporates modern comforts and richness with marble, wood vanities and crystal chandeliers. Think glamorous dressing area. Regardless of the style, open space is the key feature of modern bathrooms. Large, open-framed showers with waterfall or multi-showerheads are another key element of modern design. 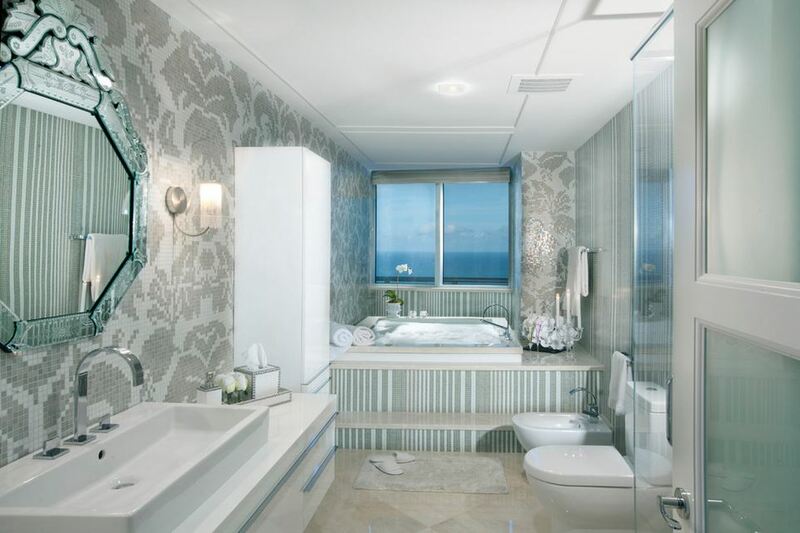 Modern bathrooms are all about luxury items, such as a heated shaving cream dispenser, drapes and plush seating. For a more modern and functional bathroom, use open-shelves, in-shower or hidden storage. New designs feature large windows to allow more natural light. Install next to the tub or shower to create the feeling of outdoor bathing. To make your bathroom more Eco-friendly, consider installing a flush converter, faucet aerator, and items made from recycled or refurbished materials. Your bathroom can benefit greatly from having an ability to control the atmosphere with a modern state-of-the-art temperature control features. Add an extra touch of coziness and richness to your bathroom by adding lush drapes. For more privacy in an open-space bathroom, install a water closet. Materials such as marble, steel and concrete are very popular for modern bathroom designs and are definitely somewhat of a trend this year. Modern design focuses on softer and calmer spaces. To achieve this, use curves and fluidity throughout your bathroom décor. Turn your bathroom into a spa-getaway with muted colors, a steam shower, and a fireplace. Incorporate natural elements such as bamboo, stones and natural lighting. Relax and soak to the sound of a crackling fire. A steam shower or sauna turns an already relaxing experience into a mini-vacation – and it’s good for you! 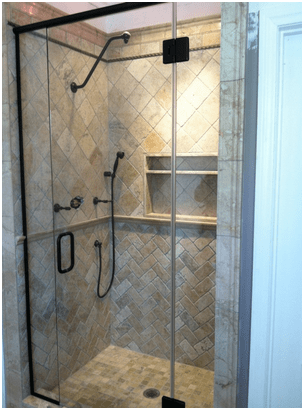 Frameless shower doors create a clean, modern and open feel. 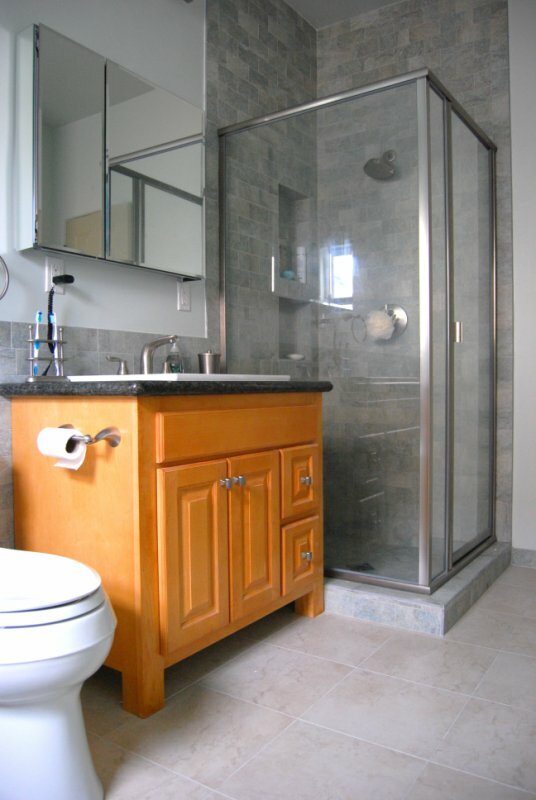 For a completely open feel, consider installing a European-style open bathroom shower system that has no doors at all! Extremely large mirrors are being used to make bathrooms appear larger. You can install an over-sized framed mirror, a mirrored wall or two-way mirrors that allow you to see through them when not in use. 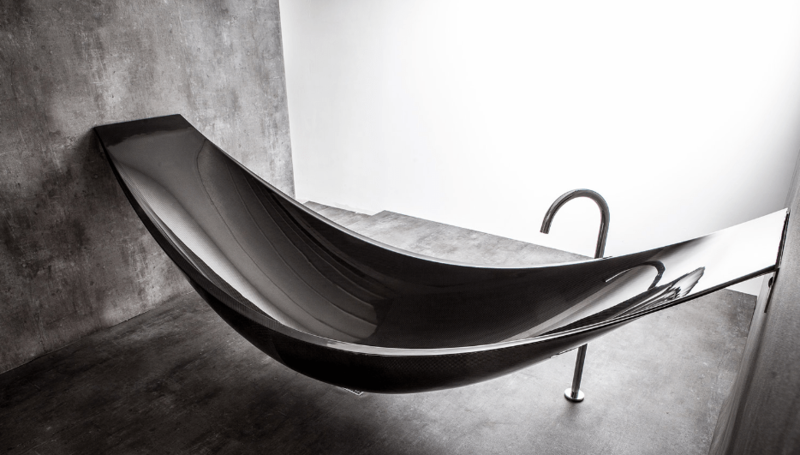 Beautifully artful floating sinks are used to create more space, while keeping clutter out of your bathroom. Although the concept of modern bathroom design is to create a space to get away from it all, technology will play a huge role in creating your oasis. Television screens are embedded into mirrors, completely hidden when turned off. Remote controlled sound systems are installed in showers or walls to allow you to listen to relaxing music as you soak in the tub. Argon charged glass allows you to keep an open feel to your bathroom while providing privacy when needed. You simply flip a switch or use a remote control to cause the glass to change from clear to dark or opaque. A traditional pedestal toilet with a tank attached is a thing of the past. You can now choose wall-mounted, tank-less and front-facing “squat” position toilets. Bidets are no longer exclusively found in Europe or in the homes of super-wealthy people. Using a bidet is not only more hygienic, it’s also Eco-friendly. Just as with toilets you can find high-style bidets with several features, including a remote-controlled model. Radiant heat, or in-floor heating, is a wonderful union of practicality and comfort. It’s more cost-effective than most heating methods and it feels really good on chilly mornings. Explore energy efficient bathroom heaters here. There is nothing more comforting, relaxing and serene than stepping out of the shower or bath and wrapping yourself in a warm towel. Using heated towel racks can add to the spa-like feeling of the modern bathroom. Multi-head showers bring luxury and functionality by misting you from all angles. As showers get larger, single showerheads are no longer practical. New designs include a waterfall head and various heads placed throughout the shower, or you can install a single unit with multiple heads attached. Vanity chests give a dressing room edge to a bathroom for a more luxurious feel. Smaller anti-fogging mirrors can be used in the shower or placed on vanities. Or, you can have a large custom-made anti-fog mirror for your wall. Did you know that you can use your smart phone or tablet to control the technology in your bathroom? Beyond the television and sound system, you can also control lights, turn on water for a bath or shower, and control the setting of your privacy windows. 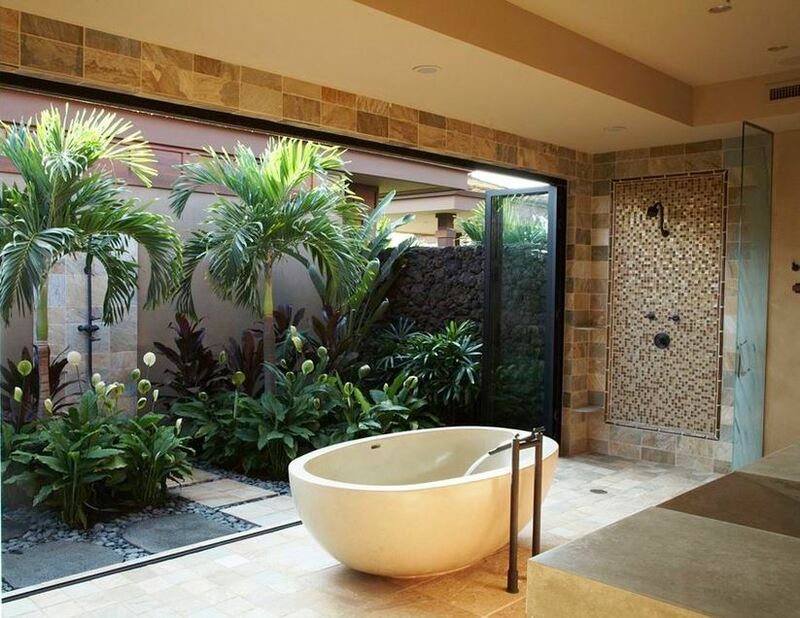 The latest trend for modern bathrooms is all about creating a sense of serenity by bringing outdoor elements inside. Waterfall showerheads have been around for a while, but they are now being used over soaking tubs, as sink faucets and as water features on walls or in art pieces. Black and white was seen all over the runway during fashion week, and is making its way into the home. It adds a sophisticated, yet simplistic look to the space. Nothing says minimalistic like steel gray. 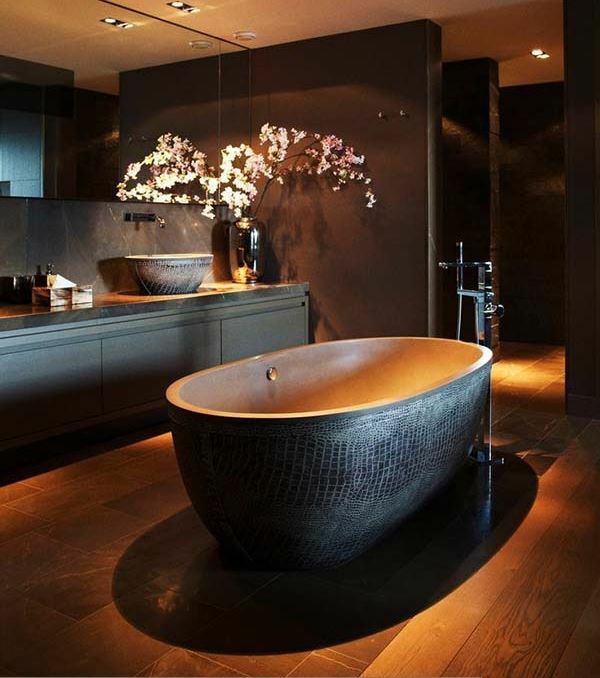 It’s luxurious while also creating a calming feel to a modern bathroom. Earthy brown tones provide a comforting feel to your modern bathroom design. It’s an excellent palette to use to achieve an outdoor bathing or spa-like design. Bold colors are out. Shades of color that are muted and serene create a calming effect. Use muted shades of aqua, blues and greens to make your bathroom have an underwater feel. Bring glamorous, unexpected lighting into the bathroom with designer lighting. Even if you don’t have a huge space, a small chandelier will add the touch of elegance you need. A trend in 2014 bathroom design is to place sconces beside mirrors and in vanity areas. 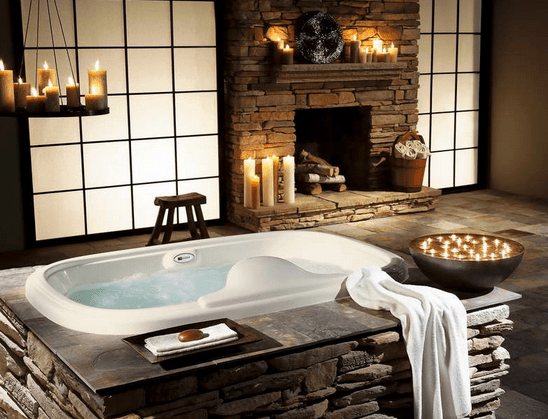 What spa-inspired bath would be complete without candles? Use candles to create an aroma therapy experience, beside a fireplace or use candle-like lighting fixtures. Did you know that LED lighting is very big in modern bathroom design right now? 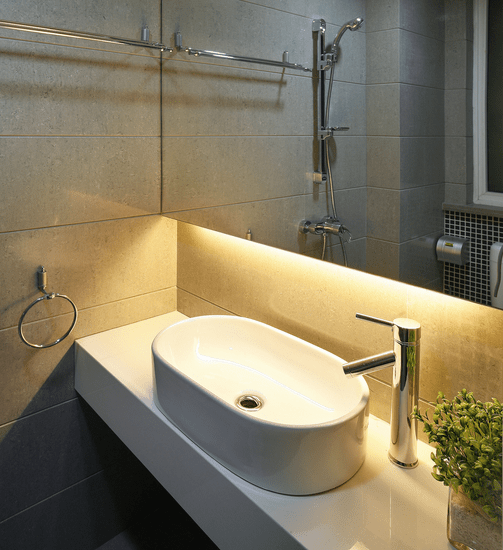 Strip LED lights can be easily used as accent lighting behind mirrors, in showerheads, and even toilet seats! Glass tiles are replacing ceramic tiles. They have a more glossy finish, which will make your bathroom appear larger. Plus, they aren’t porous like ceramic tiles, making them more resistant to mold and mildew. Use tiles to divide areas into zones, such as wet and dry areas, vanity, dressing area and the water closet. Install tiles vertically on walls to create the illusion of height. Subway tiles, especially in white, are very much on trend for bathroom design in 2016 and for the upcoming year. Use one tile in the same color for the entire space. To create a high-end hotel look “wrap” your bathroom in black or dark tile. To add depth and dimension to your tile work, use variations of the same color. Continue the tile from the floor all the way up the wall. To create the look of infinite space, install different sized tiles going from larger to smaller. For a subtle flash of color, or for visual interest, use mosaic tile and textures in the form of a stylish backsplash or as an art piece on a focal wall. Natural stone components bring a more natural look inside. Install natural stone around fireplaces, sinks and tubs. A successful remodel takes a space that’s old and outdated and turns it into something new. Most popular design trends for bathrooms in 2016 and for the upcoming year are essentially focused on taking a room that was once seen as a place purely used for functionality, and transforming it into a sanctuary designed for you to pamper and care for yourself.